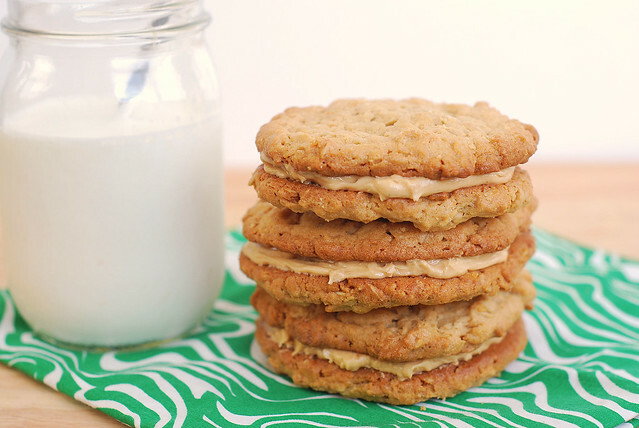 The first thing I ever made for my husband was peanut butter cookies. I had to go out and buy not only the ingredients but also baking sheets, a mixing bowl, spatulas, all that. He had told me days before that he just didn’t like cookies and I was determined to prove that he did because umm… who doesn’t like cookies?! So for that reason peanut butter cookies always remind me of him. I was craving peanut butter something fierce last week and only cookies would work. I wanted peanut butter cookies with peanut butter filling and maybe a spoonful of peanut butter on the side. These were so delicious and exactly what I wanted! I’m definitely not a texture person but for some reason I just love oats in cookies. And all the peanut butter! Mmm. If you aren’t into the filling, you could skip it – the cookies are perfectly delicious on their own. Preheat an oven to 350F. Line 2 large cookie sheets with parchment paper. In a medium bowl, whisk together the oats, flour, baking powder, baking soda, and salt. Set aside. In the bowl of a stand mixer fitted with the paddle attachment, cream together the butter and both sugars until light and fluffy. Add egg, Skippy creamy peanut butter, and vanilla. Pour oat mixture into peanut butter mixture, mixing until just combined. Place rounded teaspoonfuls of batter on the baking sheets, leaving about 2 inches between each one. Pat dough down so they form small flattened circles. Bake for about 8 minutes or until golden. Let cool on a wire rack. While the cookies are baking, beat the butter, powdered sugar, and Skippy peanut butter until combined. Add milk as needed to achieve desired consistency. To make cookie sandwich, spread a bit of frosting on one cookie, top with another cookie. 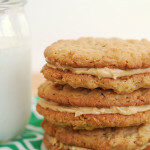 5 Responses to "Peanut Butter Oatmeal Sandwich Cookies"
These look so amazing!! I made a version of these (maybe it’s the same recipe, I’m too lazy to check my archives :) ) and it’s become a favorite of so many people in my family. ooooo i made these this past spring and they are sooooo good! soft and chewy and melt in your mouth. just seeing this post makes me want to bake up a batch! i hear on the peanut butter thing… when you want it you WANT to eat a ton of it. these look SO good. 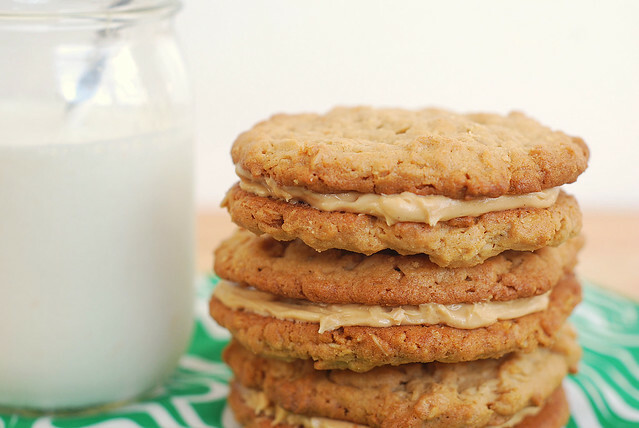 i love the idea of peanut butter cookie sandwiches instead of the typical filling. i can just taste these!